I have written 2 Brainfuck interpreters, one in C++, then another in C++ with Assembly inner loop. My interpreter code can be found here (C++/ASM, requires MSVC and MASM) and here (C++). Both are benchmarked using the mandelbrot BF program, run 20 times. After trying for a while, I managed to make the Asm version about 10% faster than the C++ version, but I'm wondering if it can be made even faster. 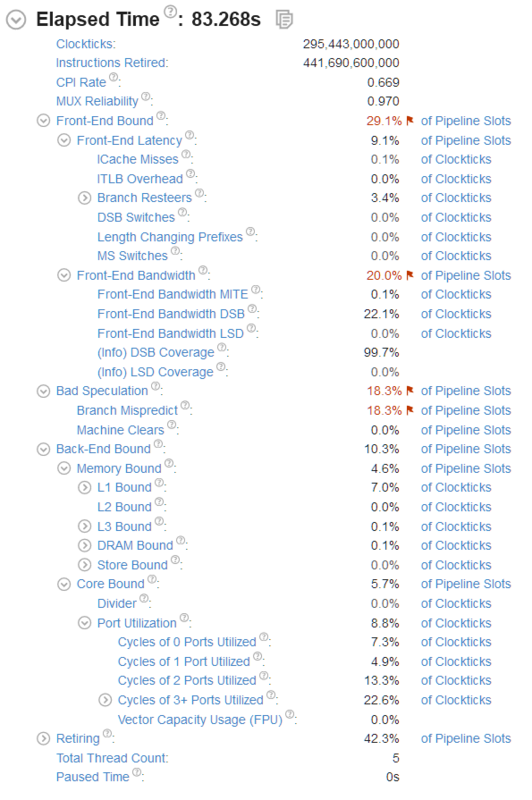 The main bottlenecks appears to be branch mispredictions and uOps cache. The benchmark ran on SkylakeX CPU. push rbx        ; these are callee saved ? sub rsp, 32     ; shadow space? Before this inner loop begins, the interpreter does a couple of simple transformation on the BF source, turning it into instructions that consist of a 2 byte opcode and 2 byte operand. Repeated instructions are collapsed into 1 instructions and the number of repeats is stored in the operand. Loop/Repeat instructions contain the index of the destination instruction it jumps to. Because of (1), there is no advantage of storing the value of current cell in register. In fact, when I tried to do that, performance got slightly worse. That is because when the interpreter encounters Left/Right instructions, it must save the current cell to memory and load the next cell, probably causing a data dependency on the register. The reason why code for Loop and Return instructions are different, is because after changing code for Loop ([ in BF) to have rare case right after cmp, I found performance increased considerably, but back fired for Return (] in BF) instruction. That seems counter intuitive to put rare case after cmp, but it seems to works here. V-Tune indicates a reduction in branch misprediction rate too. Which is strange because I expected the mov to be pretty much free through register renaming. I'd expect that most of the performance problem comes from the indirect branch (jmp qword ptr [r15 + r10 * 8]) - it's relatively unpredictable and should cause lots of branch mispredictions, bad speculations and pipeline stalls. 1) Amortise the cost. For example, if you packed 4 instructions into r10 and had a significantly larger jump table you could reduce the number of indirect branches the CPU has to do to 25% (and therefore reduce the branch mispredictions, etc). Note that BF only really has 8 instructions so you only need 3-bit opcodes, so packing 4 together could cost 12 bits and give you a 4096-entry jump table. 2) Use JIT techniques. This would probably be an order of magnitude faster, but would involve a significant "redesign and rewrite". [ADDED] For one possibility, instead of pre-compiling the BF into a "16-bit opcode + 16-bit operand" form, you could precompile BF instructions into a series of call ... 80x86 instructions and then execute the resulting series of calls. This wouldn't be "full JIT" (wouldn't be generating native code for the actual work) but it would be using "JIT techniques" (to generate code to optimise the whole "fetch and decode" part of the interpreter). Not the answer you're looking for? Browse other questions tagged performance assembly interpreter brainfuck x86 or ask your own question.